The cross is like a touch of eternal love upon the most painful wounds of man's earthly existence. HONOLULU (HawaiiNewsNow) - At the request of Bishop Larry Silva of the Diocese of Honolulu, the Sisters of Saint Francis in Syracuse, New York will give a first class relic of Blessed Marianne Cope to the Diocese of Honolulu [Good for him for asking and good for her for giving a relic]. Blessed Marianne is, after St. Damien [who was canonized on October 11, 2009], Hawaii's second candidate for sainthood. She succeeded Father Damien as the guiding force of the Hansen's disease settlement in Kalaupapa, Molokai, from 1889 until her death there in 1918. Sister Patricia Burkard, general minister of the Mother Marianne's religious community, the Sisters of Saint Francis of the Neumann Communities, will bring the relic -- bone fragments from Blessed Marianne's remains -- to Hawaii on May 4. First class relics are parts of the body -- usually bone or hair -- of a saint or beatified person. Second-class relics are items used by the saint such as clothing or a book. Third class relics are items that have been touched by a first or second-class relic, usually pieces of cloth or a holy card [you don't generally find this explanation in news stories, especially secular ones; good for HNN]. The relic will begin a tour of the islands on May 6, stopping at selected churches for veneration and Mass, before it is put on permanent display in the Cathedral of Our Lady of Peace on May 13 [I look forward to venerating the relic when I next return to Hawai'i]. May 14 is the sixth anniversary of Mother Marianne's beatification in Rome. "Blessed Marianne's first visit to a place of worship in Hawaii was to the Cathedral of Our Lady of Peace, where on the day of her arrival on November 8, 1883, she was welcomed by Bishop Koeckemann, by the Sacred Hearts Congregation's priests and sisters, by the Brothers of Mary, and a crowd of Hawaiians of every faith who filled every available space in the church," said Burkard. The bone fragments were collected when Blessed Marianne's remains were exhumed from her gravesite in Kalaupapa in January 2005 for transport to the motherhouse of her Sisters of St. Francis in Syracuse. The fragments were rechecked for their authenticity by a forensic anthropologist in Utica, N.Y., Blessed Marianne's hometown. Father Dwight Longenecker has a good post in which he reflects on faith and humor. He also mentions the legend of medieval juggler who wanted to give a gift to God but didn't know what he could give. Go read the post. And then go find the story of The Clown of God, beautifully illustrated and told by the master of children's books, Tomie dePaola. Here in the See City we have been under clouds for the better of a week (it may even be two weeks), with rain falling most every day. Thankfully, we were allowed a brief glimpse of the sun yesterday morning, the clouds today have returned. If often happens in parishes the Bishop visits for Confirmations that a group photograph is taken just after the recession. Consequently, I don't always have the opportunity to thank the mitre and crozier bearers before we leave. I can thank the other servers who are ahead of me before they return to the sacristy, but the mitre and crozier bearers have a knack of returning to the sacristy before I have a chance to turn around. With this in mind, I sometimes offer a sign of peace to them and thank for their help. When I did so last evening, the mitre bearer asked, "Are we done now?" I may have to find a new strategy. President Barack Obama has now released the long form of his Hawaiian birth certificate, in the hopes of putting an end to the debate as to where he was born. In his remarks to the nation, the President said, "We do not have time for this kind of silliness." One might well wonder - if that statement is true - why he waited so long to release the document. I'm reminded of one of Obi Wan Kenobi's great lines: "Who's the more foolish: the fool, or the one who follows him?" One might ask, Who's the more silly: the one asking silly questions or the one who lets it go on so long? Now, before I am attacked for speaking against the President, my comments above are well reflective of any situations. My logical mind would have me ask the same question of anyone who would make a similar statement. WGN-TV has a piece on the process for beatification and canonization of the Servant of God Father Augustus Tolton. Since 1701, under the force of law, no Catholic - or one married to a Catholic - is eligible to ascend the English throne. It is, without doubt, blatant anti-Catholicism and a clear indication that anti-Catholicism is, as Philip Jenkins has wisely and memorable named it, "the last acceptable prejudice." London, England, April 25 (CNA/EWTN News) .- In the week of the Royal Wedding, a centuries-old law banning British monarchs from becoming or marrying a Catholic is sparking a row in the United Kingdom. London's Daily Telegraph reported on April 25 that plans to abolish the 1701 Act of Settlement have been ditched because of "significant objections" from the Church of England. Now the First Minister of Scotland, Alex Salmond, has written to the British Government asking for urgent clarification. "I recently wrote to the Prime Minister (David Cameron) calling for the abolition of all discrimination contained in the Act of Settlement, including its blatant discrimination towards Catholics, which is completely unacceptable in a modern society. I am deeply concerned at these reports that this much-needed and long overdue reform has been shelved by the UK Government," Salmond wrote. There is no similar prohibition on the British royal family marrying members of other faiths such as Islam or Judaism [which defeats the argument against a Catholic being the Supreme Governor of the Church of England], or those who are agnostic or athiest. Anglicanism is still the state religion in England and the monarch is called the "Supreme Governor" of the Anglican faith. A spokesman for the British Government told the Telegraph, that the government "accepts there are provisions (in the Act) which could be discriminatory [still, they aren't really moving to do anything about it]." However, he added, the process of amending the law is "a complex and difficult matter that requires careful and thoughtful consideration" because it effects succession to England's throne. A Church of England spokesman expressed similar concerns. He said that the anti-Catholic prohibition "inevitably" looks outdated [that's right: it's only an appearance]. "But if the prohibition were removed the difficulty would still remain that establishment requires the monarch to join in communion with the Church of England as its Supreme Governor and that is not something that a Roman Catholic would be able to do consistently with the current rules of that Church [true, but neither could a Muslim or a Hindu, who aren't banned by law]," the spokesman told The Telegraph. The Act was originally passed to prevent the descendants of the Catholic King James II from ascending the throne. He was deposed in the 1688 "glorious revolution" by supporters of the Protestant William and Mary. Mary was the eldest Protestant daughter of James II and was married to William of Orange, who later became William III. In recent years, the Act has effected several members of the British royal family. In 2001, Lord Nicholas Windsor, the youngest son of the Duke and Duchess of Kent, permanently forfeited his right to the royal succession by converting to Catholicism. In 2008, Autumn Kelly, the Canadian fiancee of the Queen's grandson Peter Philips, converted from Catholicism to Anglicanism, thus preserving her husband's chances of becoming king. The present second-in-line to the British throne, Prince William, will marry Kate Middleton on April 29 at a Anglican service in London's Westminster Abbey. The example of a saint of our time can to some degree help us understand what it means to have a real encounter with this God for the first time. I am thinking of the African Josephine Bakhita, canonized by Pope John Paul II. She was born around 1869—she herself did not know the precise date—in Darfur in Sudan. At the age of nine, she was kidnapped by slave-traders, beaten till she bled, and sold five times in the slave-markets of Sudan. Eventually she found herself working as a slave for the mother and the wife of a general, and there she was flogged every day till she bled; as a result of this she bore 144 scars throughout her life. Finally, in 1882, she was bought by an Italian merchant for the Italian consul Callisto Legnani, who returned to Italy as the Mahdists advanced. Here, after the terrifying “masters” who had owned her up to that point, Bakhita came to know a totally different kind of “master”—in Venetian dialect, which she was now learning, she used the name “paron” for the living God, the God of Jesus Christ. Up to that time she had known only masters who despised and maltreated her, or at best considered her a useful slave. Now, however, she heard that there is a “paron” above all masters, the Lord of all lords, and that this Lord is good, goodness in person. She came to know that this Lord even knew her, that he had created her—that he actually loved her. She too was loved, and by none other than the supreme “Paron”, before whom all other masters are themselves no more than lowly servants. She was known and loved and she was awaited. What is more, this master had himself accepted the destiny of being flogged and now he was waiting for her “at the Father's right hand”. Now she had “hope” —no longer simply the modest hope of finding masters who would be less cruel, but the great hope: “I am definitively loved and whatever happens to me—I am awaited by this Love. And so my life is good.” Through the knowledge of this hope she was “redeemed”, no longer a slave, but a free child of God. She understood what Paul meant when he reminded the Ephesians that previously they were without hope and without God in the world—without hope because without God. Hence, when she was about to be taken back to Sudan, Bakhita refused; she did not wish to be separated again from her “Paron”. On 9 January 1890, she was baptized and confirmed and received her first Holy Communion from the hands of the Patriarch of Venice. On 8 December 1896, in Verona, she took her vows in the Congregation of the Canossian Sisters and from that time onwards, besides her work in the sacristy and in the porter's lodge at the convent, she made several journeys round Italy in order to promote the missions: the liberation that she had received through her encounter with the God of Jesus Christ, she felt she had to extend, it had to be handed on to others, to the greatest possible number of people. The hope born in her which had “redeemed” her she could not keep to herself; this hope had to reach many, to reach everybody (3). Over the past couple of days I have been rather surprised - and not in a good way - at the comments made to my post about Bishop Paprocki's authorizing the Prayer to St. Michael the Archangel to be publicly prayed after the dismissal at Mass. Consequent of these negative - and often condemnatory - comments from those who claim to support such an endeavor, I have closed comments on the post and will no longer publish the comments on the post previously published. Comments on other posts remain open. Please, when commenting on these pages, remember truth in charity. Ever since Hosni Mubarek stepped down as President of Egypt, there have been very few journalistic reports of the present situation in Egypt as the people prepare for their upcoming election. It is very remarkable what has happened in Egypt in the last 4 months. At the beginning there was a lot of excitement about the revolution and its unlimited potential. Now this is the day after and things are turning fast into the unknown. Simply put no one knows what will happen in the next few months. Now there is a state of chaos in the country. There is no effective government. There is no law and no police force. That has allowed the criminals to roam the city and commit crimes with impunity. There are many stories of people stopping motorists and forcing them to sign a sell contract to sell their cars by force for free to those criminals. Even some people started building illegal buildings with no permits since no one is watching. But the most significant thing is the emergence of a new group called “Salafeyeen” who aspire to return Egypt to the early days of Islam. I had never heard of them before. They are very radical and they are not bashful to broadcast their manifesto which is essentially against any progress, against women and against Christians. By comparison the Muslim brotherhood is like the Boy Scout. The Salafeyeen have been attacking mainstream Muslim mosques and taking them over. They consider the Muslim brotherhood not Muslim enough. They want to impose a very strict Sharia law. They also hint that the revolutions in other Arab countries will lead to a new Caliphate of pure Islam in the Middle East. Every day new discoveries are revealed of the huge amount of money amassed by Mubarak and his cronies. It is unreal in a poor country. Billions of dollars and Sterling pounds have been stolen by almost every cabinet member in the last 20 some years. It is very frightening to think that the corruption did not leave anyone at the top clean. I am still hopeful. In the middle of this uncertainty and anxiety there is a silver lining. The youth who started the revolution still has the passion and the desire to change their country. They have been silent recently. Their voices have been smothered by the louder religious groups. I still believe that they will not sit idle as their beloved country is being taken away by the vultures. But in several discussions with a large group of Egyptians it seems I am the only one who is optimistic. The Easter service here was muted and low profile. The churches were not as full as they usually are.. People are still afraid of another explosion. I must admit that during church servicess I expected some explosion somewhere. It did not happen and that was a good start. I am sure this ambiguous situation represents a nightmare for the Obama administration. They don’t know what to do now except wait and see how the parliamentarian and presidential elections will turn out. This in large will determine the direction of the country. Will Egypt be another Iran or another Turkey we don’t really know? Let us hope. As far as personal safety we feel safe. I am not worried about that. I am more worried about the direction of this country which 4 months ago was on cloud 9 after the revolution. We need that feeling back. The feeling of a country coming out of darkness into the light. Let us hope that Light will prevail. Recent studies have shown that women taking newer forms of the birth control pill are 2-3 times more likely to develop blood clots. If the moral reasoning against the use of oral contraception isn't good enough for some women, maybe the risk of their life is. In Indonesia, police outside Jakarta stop radical Muslims from using five bombs to destroy a Catholic church. Several readers have asked - some kindly and others not - which translation of the Prayer to St. Michael the Archangel Bishop Paprocki approved for use between the dismissal and recession. I do not think the printing of this translation reflects a dismissal of other translations, of which I have seen several. This gives the congregation one translation to pray together since several translations that differ slightly one from the other are in use. A moment ago a status update from Dr Pepper on Facebook caught my attention. It reads, "Welcome back to those who gave us up! 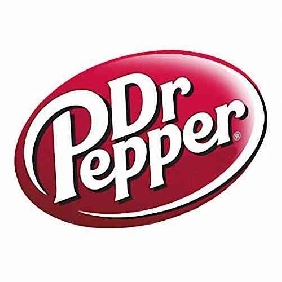 How did your first sip taste?" It's nice to see a company acknowledge it's Catholic supporters. Though I didn't give you up for Lent (my Lenten penance is supposed to be for me, not for others), I'm grateful for your thoughtfulness! P.S. : Thom, this post is just for you. In his homily during the great Easter Vigil, Pope Benedict XVI explored the meaning of the Easter fire and of water, while focusing most of his attention on faith and reason and what it implies for Sunday. It is a homily well worth your time. Yet these great signs of creation, light and water, are not the only constituent elements of the liturgy of the Easter Vigil. Another essential feature is the ample encounter with the words of sacred Scripture that it provides [too many complain and grumble - as the Israelites did in the desert - of having to listen to a few readings from the Scripture. They forget that this very night is about salvation history. This is the night!]. Before the liturgical reform there were twelve Old Testament readings and two from the New Testament [now we have but seven from the Old Testament and one from the New Testament (plus the Gospel)]. The New Testament readings have been retained. The number of Old Testament readings has been fixed at seven, but depending upon the local situation, they may be reduced to three [I've never seen a really good reason to reduce them. Most parishes in the US seem to reduce them to four; I see no reason not to do all seven. It is a vigil, after all and the people who come know it will take some time and those who don't sit often encough through a 3-hour ball game without complaining]. The Church wishes to offer us a panoramic view of whole trajectory of salvation history, starting with creation, passing through the election and the liberation of Israel to the testimony of the prophets by which this entire history is directed ever more clearly towards Jesus Christ. In the liturgical tradition all these readings were called prophecies. Even when they are not directly foretelling future events, they have a prophetic character, they show us the inner foundation and orientation of history. They cause creation and history to become transparent to what is essential. In this way they take us by the hand and lead us towards Christ, they show us the true Light [Herein lies the beauty and power of this night]. The central message of the creation account can be defined more precisely still. In the opening words of his Gospel, Saint John sums up the essential meaning of that account in this single statement: “In the beginning was the Word”. In effect, the creation account that we listened to earlier is characterized by the regularly recurring phrase: “And God said ...” The world is a product of the Word, of the Logos, as Saint John expresses it, using a key term from the Greek language. “Logos” means “reason”, “sense”, “word”. It is not reason pure and simple, but creative Reason, that speaks and communicates itself. It is Reason that both is and creates sense. The creation account tells us, then, that the world is a product of creative Reason. Hence it tells us that, far from there being an absence of reason and freedom at the origin of all things, the source of everything is creative Reason, love, and freedom. Here we are faced with the ultimate alternative that is at stake in the dispute between faith and unbelief: are irrationality, lack of freedom and pure chance the origin of everything, or are reason, freedom and love at the origin of being? Does the primacy belong to unreason or to reason? This is what everything hinges upon in the final analysis. As believers we answer, with the creation account and with Saint John, that in the beginning is reason. In the beginning is freedom. Hence it is good to be a human person. It is not the case that in the expanding universe, at a late stage, in some tiny corner of the cosmos, there evolved randomly some species of living being capable of reasoning and of trying to find rationality within creation, or to bring rationality into it. If man were merely a random product of evolution in some place on the margins of the universe, then his life would make no sense or might even be a chance of nature. But no, Reason is there at the beginning: creative, divine Reason. And because it is Reason, it also created freedom; and because freedom can be abused, there also exist forces harmful to creation. Hence a thick black line, so to speak, has been drawn across the structure of the universe and across the nature of man. But despite this contradiction, creation itself remains good, life remains good, because at the beginning is good Reason, God’s creative love. Hence the world can be saved. Hence we can and must place ourselves on the side of reason, freedom and love – on the side of God who loves us so much that he suffered for us, that from his death there might emerge a new, definitive and healed life. Easter and the paschal experience of Christians, however, now require us to take a further step. The Sabbath is the seventh day of the week. After six days in which man in some sense participates in God’s work of creation, the Sabbath is the day of rest. But something quite unprecedented happened in the nascent Church: the place of the Sabbath, the seventh day, was taken by the first day. As the day of the liturgical assembly, it is the day for encounter with God through Jesus Christ who as the Risen Lord encountered his followers on the first day, Sunday, after they had found the tomb empty. The structure of the week is overturned. No longer does it point towards the seventh day, as the time to participate in God’s rest. It sets out from the first day as the day of encounter with the Risen Lord. This encounter happens afresh at every celebration of the Eucharist, when the Lord enters anew into the midst of his disciples and gives himself to them, allows himself, so to speak, to be touched by them, sits down at table with them. This change is utterly extraordinary, considering that the Sabbath, the seventh day seen as the day of encounter with God, is so profoundly rooted in the Old Testament. If we also bear in mind how much the movement from work towards the rest-day corresponds to a natural rhythm, the dramatic nature of this change is even more striking. This revolutionary development that occurred at the very the beginning of the Church’s history can be explained only by the fact that something utterly new happened that day. The first day of the week was the third day after Jesus’ death. It was the day when he showed himself to his disciples as the Risen Lord. In truth, this encounter had something unsettling about it. The world had changed. This man who had died was now living with a life that was no longer threatened by any death. A new form of life had been inaugurated, a new dimension of creation. The first day, according to the Genesis account, is the day on which creation begins. Now it was the day of creation in a new way, it had become the day of the new creation. We celebrate the first day. And in so doing we celebrate God the Creator and his creation. Yes, we believe in God, the Creator of heaven and earth. And we celebrate the God who was made man, who suffered, died, was buried and rose again. We celebrate the definitive victory of the Creator and of his creation. We celebrate this day as the origin and the goal of our existence. We celebrate it because now, thanks to the risen Lord, it is definitively established that reason is stronger than unreason, truth stronger than lies, love stronger than death. We celebrate the first day because we know that the black line drawn across creation does not last for ever. We celebrate it because we know that those words from the end of the creation account have now been definitively fulfilled: “God saw everything that he had made, and behold, it was very good” (Gen 1:31). Amen. At the heart of this morning’s liturgy is the blessing of the holy oils – the oil for anointing catechumens, the oil for anointing the sick, and the chrism for the great sacraments that confer the Holy Spirit: confirmation, priestly ordination, episcopal ordination. In the sacraments the Lord touches us through the elements of creation. The unity between creation and redemption is made visible. The sacraments are an expression of the physicality of our faith, which embraces the whole person, body and soul [this is, afterall, what it means to be human, a union of body and soul]. Bread and wine are fruits of the earth and work of human hands. The Lord chose them to be bearers of his presence. Oil is the symbol of the Holy Spirit and at the same time it points us towards Christ: the word “Christ” (Messiah) means “the anointed one”. The humanity of Jesus, by virtue of the Son’s union with the Father, is brought into communion with the Holy Spirit and is thus “anointed” in a unique way, penetrated by the Holy Spirit. What happened symbolically to the kings and priests of the Old Testament when they were instituted into their ministry by the anointing with oil, takes place in Jesus in all its reality: his humanity is penetrated by the power of the Holy Spirit. He opens our humanity for the gift of the Holy Spirit. The more we are united to Christ, the more we are filled with his Spirit, with the Holy Spirit. We are called “Christians”: “anointed ones” – people who belong to Christ and hence have a share in his anointing, being touched by his Spirit. I wish not merely to be called Christian, but also to be Christian, said Saint Ignatius of Antioch. Let us allow these holy oils, which are consecrated at this time, to remind us of the task that is implicit in the word “Christian”, let us pray that, increasingly, we may not only be called Christian but may actually be such. In today’s liturgy, three oils are blessed, as I mentioned earlier. They express three essential dimensions of the Christian life on which we may now reflect. First, there is the oil of catechumens. This oil indicates a first way of being touched by Christ and by his Spirit – an inner touch, by which the Lord draws people close to himself. Through this first anointing, which takes place even prior to baptism, our gaze is turned towards people who are journeying towards Christ – people who are searching for faith, searching for God. The oil of catechumens tells us that it is not only we who seek God: God himself is searching for us [too often we forget this deep reality and try to brush aside his tugs at our hearts]. The fact that he himself was made man and came down into the depths of human existence, even into the darkness of death, shows us how much God loves his creature, man. Driven by love, God has set out towards us. “Seeking me, you sat down weary ... let such labour not be in vain!”, we pray in the Dies Irae. God is searching for me. Do I want to recognize him? Do I want to be known by him, found by him? [This is the great question of the modern age. Many do not want to recognize God or to be known by him, because they know instinctively that they must then change their lives.] God loves us. He comes to meet the unrest of our hearts, the unrest of our questioning and seeking, with the unrest of his own heart, which leads him to accomplish the ultimate for us. That restlessness for God, that journeying towards him, so as to know and love him better, must not be extinguished in us [Saint Augustine said it somewhat differently when he wrote in his Confession: "You have made us for yourself, O God, and our hearts are restless until they rest in you"]. In this sense we should always remain catechumens. “Constantly seek his face”, says one of the Psalms (105:4). Saint Augustine comments as follows: God is so great as to surpass infinitely all our knowing and all our being. Knowledge of God is never exhausted. For all eternity, with ever increasing joy, we can always continue to seek him, so as to know him and love him more and more. “Our heart is restless until it rests in you”, said Saint Augustine at the beginning of his Confessions [I guess I thought too far ahead]. Yes, man is restless, because whatever is finite is too little. But are we truly restless for him? Have we perhaps become resigned to his absence, do we not seek to be self-sufficient? Let us not allow our humanity to be diminished in this way! Let us remain constantly on a journey towards him, longing for him, always open to receive new knowledge and love! Then there is the oil for anointing the sick. Arrayed before us is a host of suffering people: those who hunger and thirst, victims of violence in every continent, the sick with all their sufferings, their hopes and their moments without hope, the persecuted, the downtrodden, the broken-hearted. Regarding the first mission on which Jesus sent the disciples, Saint Luke tells us: “he sent them out to preach the kingdom of God and to heal” (9:2). Healing is one of the fundamental tasks entrusted by Jesus to the Church, following the example that he gave as he travelled throughout the land healing the sick. To be sure, the Church’s principal task is to proclaim the Kingdom of God. But this very proclamation must be a process of healing: “bind up the broken-hearted”, we heard in today’s first reading from the prophet Isaiah (61:1). The proclamation of God’s Kingdom, of God’s unlimited goodness, must first of all bring healing to broken hearts. By nature, man is a being in relation. But if the fundamental relationship, the relationship with God, is disturbed, then all the rest is disturbed as well. If our relationship with God is disturbed, if the fundamental orientation of our being is awry, we cannot truly be healed in body and soul. For this reason, the first and fundamental healing takes place in our encounter with Christ who reconciles us to God and mends our broken hearts. But over and above this central task, the Church’s essential mission also includes the specific healing of sickness and suffering. The oil for anointing the sick is the visible sacramental expression of this mission. Since apostolic times, the healing vocation has matured in the Church, and so too has loving solicitude for those who are distressed in body and soul. This is also the occasion to say thank you to those sisters and brothers throughout the world who bring healing and love to the sick, irrespective of their status or religious affiliation. From Elizabeth of Hungary, Vincent de Paul, Louise de Marillac, Camillus of Lellis to Mother Teresa – to recall but a few names – we see, lighting up the world, a radiant procession of helpers streaming forth from God’s love for the suffering and the sick. For this we thank the Lord at this moment. For this we thank all those who, by virtue of their faith and love, place themselves alongside the suffering, thereby bearing definitive witness to the goodness of God himself. The oil for anointing the sick is a sign of this oil of the goodness of heart that these people bring – together with their professional competence – to the suffering. Even without speaking of Christ, they make him manifest. In third place, finally, is the most noble of the ecclesial oils, the chrism, a mixture of olive oil and aromatic vegetable oils. It is the oil used for anointing priests and kings, in continuity with the great Old Testament traditions of anointing. In the Church this oil serves chiefly for the anointing of confirmation and ordination. Today’s liturgy links this oil with the promise of the prophet Isaiah: “You shall be called the priests of the Lord, men shall speak of you as the ministers of our God” (61:6). The prophet makes reference here to the momentous words of commission and promise that God had addressed to Israel on Sinai: “You shall be to me a kingdom of priests and a holy nation” (Ex 19:6). In and for the vast world, which was largely ignorant of God, Israel had to be as it were a shrine of God for all peoples, exercising a priestly function vis-à-vis the world. It had to bring the world to God, to open it up to him. In his great baptismal catechesis, Saint Peter applied this privilege and this commission of Israel to the entire community of the baptized, proclaiming: “But you are a chosen race, a royal priesthood, a holy nation, God’s own people, that you may declare the wonderful deeds of him who called you out of darkness into his marvellous light. Once you were no people but now you are God’s people” (1 Pet 2:9f.) Baptism and confirmation are an initiation into this people of God that spans the world; the anointing that takes place in baptism and confirmation is an anointing that confers this priestly ministry towards mankind. Christians are a priestly people for the world. Christians should make the living God visible to the world, they should bear witness to him and lead people towards him. When we speak of this task in which we share by virtue of our baptism, it is no reason to boast. It poses a question to us that makes us both joyful and anxious: are we truly God’s shrine in and for the world? Do we open up the pathway to God for others or do we rather conceal it? Have not we – the people of God – become to a large extent a people of unbelief and distance from God? Is it perhaps the case that the West, the heartlands of Christianity, are tired of their faith, bored by their history and culture, and no longer wish to know faith in Jesus Christ? We have reason to cry out at this time to God: “Do not allow us to become a ‘non-people’! Make us recognize you again! Truly, you have anointed us with your love, you have poured out your Holy Spirit upon us. Grant that the power of your Spirit may become newly effective in us, so that we may bear joyful witness to your message! For all the shame we feel over our failings, we must not forget that today too there are radiant examples of faith, people who give hope to the world through their faith and love. When Pope John Paul II is beatified on 1 May, we shall think of him, with hearts full of thankfulness, as a great witness to God and to Jesus Christ in our day, as a man filled with the Holy Spirit. Alongside him, we think of the many people he beatified and canonized, who give us the certainty that even today God’s promise and commission do not fall on deaf ears. I turn finally to you, dear brothers in the priestly ministry. Holy Thursday is in a special way our day. At the hour of the last Supper, the Lord instituted the new Testament priesthood. “Sanctify them in the truth” (Jn 17:17), he prayed to the Father, for the Apostles and for priests of all times. With great gratitude for the vocation and with humility for all our shortcomings, we renew at this hour our “yes” to the Lord’s call: yes, I want to be intimately united to the Lord Jesus, in self-denial, driven on by the love of Christ. Amen. Look down upon me, good and gentle Jesus, while before Thy face I humbly kneel, and with burning soul pray and beseech Thee to fix in my heart lively sentiments of faith, hope, and charity, a true contrition for my sins, and a firm purpose of amendment; the while I contemplate with great love and tender pity Thy five wounds, pondering over them within me, and calling to mind the words, which David, Thy prophet, said of Thee, my Jesus: "They have pierced My hands and My feet; they have numbered all my bones" (Psalm 21:17,18). Jesus Christ, our Lord and God, we adore the sacred wound of Thy right hand, and we thank Thee for the bitter pains endured for love of us; we compassionate Thee in Thy sufferings and sympathize with Thy sorrowful Mother. Grant us through Thy infinite merits pardon for our numerous sins. We regret and deplore them more than any other evil, because by them we have offended Thy goodness. Jesus Christ, our Lord and God, we adore the sacred wound of Thy left hand and thank Thee for the bittin pains endured for love of us; ﻿we compassionate Thee in Thy sufferings and sympathize with Thy sorrowful Mother. Grant us through Thy infinite merits the necessary grace and strength never again to ofend Thee by mortal sin, but to persevere in Thy grace and love until death. Jesus Christ, our Lord and God, we adore the sacred wound of Thy right foot; we thank Thee for the bittin pains endured for love of us; ﻿we compassionate Thee in Thy sufferings and sympathize with Thy sorrowful Mother. Grant us through Thy infinite merits remission of the eternal punishments we have so often deserved for our sins. Never, O Lord, permit us to be cast into hell, where we could no longer love Thee. Jesus Christ, our Lord and God, we adore the sacred wound of Thy left foot; we thank Thee for the bittin pains endured for love of us; ﻿we compassionate Thee in Thy sufferings and sympathize with Thy sorrowful Mother. Grant us through Thy infinite merits the grace to attain to heavenly glory, where we shall praise, bless, and love Thee for all eternity. R. Have mercy of us! Jesus Christ, our Lord and God, we adore the sacred wound of Thy sacred side; we thank Thee for Thy bittin pains endured for love of us; ﻿we compassionate Thee in Thy sufferings and sympathize with Thy sorrowful Mother, who alone could understand the pangs of Thy Sacred Heart. Grant us through the infinite merits of Thy sufferings and Thy precious wounds, Thy holy love, that loving Thee sincerely here below, we may attain to Thy beatifici vision and love Thee for all eternity. O Virgin Mary, Mother of God, the sight of the bruised and mangled body of Thy dear Son, made thee Queen of Martyrs. Thou hast, through untold sufferings and the immolation of thy only-begotten Son, shared in the sacrifice made for our redemption. I compassionate thee because of these heart-rending sufferings and thank thee for the excessive love with whih thou didst readily offer thy Son as our ransom. Make intercession for us to thy dear Son and His heavenly Father, that we may resolutely amend our lives and never more crucify our dearest Savior, but, that persevering through the infinite merits of His better passion and death. Amen. O Lord Jesus Christ, Who in the sixth hour of the day wast nailed to the cross for the redemption of the world and there didst shed the last drop of Thy precious Blood for the remission of our sins, we humbly beseech Thee to grant us, that after our death we may joyfully enter the gates of eternal happiness. Grant, we beseech Thee, O Lord Jesus Christ, that now an at the hour of our death, Mary, ever blessed Virgin, Thy Mother, whose soul was pierced with a sword in the hour of Thy Passion, may intercede for us. Through Thee, Jesus Christ, Savior of the world, Who with the Father and the Holy Ghost livest and reignest for ever and ever. Amen. Oh, Priest! who are you? Not through yourself, since you are from nothing. Not you, since you are God. You are nothing, and all. A Catholic Mom in Hawai'i recently tagged me for the "Why do I love him?" meme, "him" being Jesus. Because, in short, he first loved me. If you would like to do this meme yourself, consider yourself tagged. This evening promises to be a time for both deep reflection and fellowship. All is nearly ready in the church for this evening's Mass of the Lord's Supper and the dining room is ready for dinner with a few area priests following the Mass. I've spent a good part of the afternoon in the kitchen laughing and visiting with Father Leo Patalinghug of Grace Before Meals, who will be us for Holy Week. It's delicious. A happy and blessed Holy Thursday to each of you! In recent years, a number of parishes have begun reciting the prayer once more, and many individual Catholics have kept up the practice. 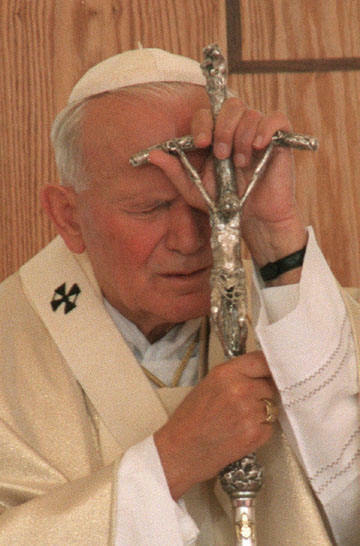 Both Pope John Paul II and Pope Benedict XVI have urged the faithful to pray it daily, and especially after Mass. I envision a local Church where Catholics seek to grow in holiness, attend Mass every Sunday and participate regularly in the sacramental life of the Church. I see Catholics, who love God with all their heart, mind and soul and love their neighbors as themselves. I see the faithful who bear witness to Jesus Christ in their daily lives and promote respect for all human life from conception to natural death. I envision an abundance of vocations with priests sufficient to staff and serve our parishes with virtuous commitment. I see dedicated deacons, nuns, brothers and lay people teaching the faith, caring for the sick, reaching out to the poor and dying. I see communities where family life is valued, homes where mothers and fathers love their children and whose children love them. In short, I envision God's kingdom already foreshadowed in the life of the Church and a foretaste of the heavenly banquet in the Eucharistic feast. Everything that I have described is attainable. The only real obstacle in our lives is sin. Original sin is our inherited condition. The spiritual treasures of paradise were forfeited by our human ancestors. While Jesus Christ's death and resurrection have restored the gifts of heavenly treasures for us, we also have to recognize that the devil, Satan, is real, and he will do everything in his power to deflect us from our goal, which is eternal life with Christ in His kingdom. This reality should not frighten us nor lead us to despair, for Christ is more powerful than Satan. Prayer and the sacraments are an essential part of what Saint Paul called the "armor of God" in his letter to the Ephesians. The Saint Michael prayer can help us "stand against the deceits of the devil" (Ephesians 6:11) by "taking the shield of faith" (Ephesians 6:16). God permits us to be tempted by the devil but gives us the grace to resist him through prayer in our daily lives. We can and should say the prayer to Saint Michael the Archangel at church with the assembly or on our own during the day for spiritual protection for ourselves and for others. May God bless our diocese and our mission with every grace we need to grow in faith, hope and love. May Saint Michael the Archangel protect us from all evil, harm and temptation. 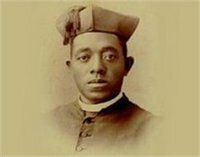 This year marks the 125th anniversary of the ordination of the Servant of God Father Augustus Tolton to the Priesthood of Jesus Christ. He was ordained at Rome in the Lateran Basilica of St. John on the 24th of April in the year of Our Lord 1886. He celebrated his first Mass in St. Peter's the next day (Easter Sunday). To mark this great anniversary, His Excellency the Most Reverend Joseph N. Perry, Auxiliary Bishop of Chicago and Diocesan Postulator of the Cause will celebrate the Holy Mass in St. Peter's church in Quincy, Illinois at 3:00 p.m. on June 5, 2011. It was St. Peter's Parish and School that welcomed young Gus and provided his education and provided his formation to prepare him to study at the seminary of the Propaganda Fide. Everyone is naturally invited to attend this Mass to render thanks to God for this faithful servant and steward, and to pray for the progress of the Cause for his beatification and canonization. A dinner will follow the Mass at Quincy University Student Center. Reservations for the dinner are required and a check in the amount of $30.00 should be mailed to Vicariate IV, P.O. Box 773, South Holland, Illinois 60473. Not far from the Cathedral is an antique store - Widow at Windsor - that I pass frequenly on my walks. In the front window a large wooden crucifix from the 1800s has caught my eye so this morning I decided to pop in and take a look around. I had a nice conversation with the proprietor during which he asked if I knew when the skull and cross bones stopped being placed on crucifixes. I'm not certain, and wonder if you any of you good readers do. In Pakistan, Muslim militants attacked a Pentecostal church and kidnapped two. 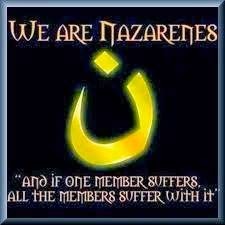 Many were left beaten and twelve Christians were arrested; no Muslims were arrested. It started over an accusation of blasphemy. Christians are also holding a Day of Prayer today for Asia Bibi and others accused of blasphemy; Bibi, a Catholic, was sentenced to death after being accused of blasphemy against Muhammed. In Nigeria, Muslim militants burn Christian churches and homes and looted Christian businesses after a Christian man won an election. Muslim supports of the elected Christian were also attacked. In Syrian, Orthodox Christians scale back Holy Week celebrations. In California, a Catholic church has been destroyed by arson. In Spain, the church of La Sagrada Familia - recently consecrated by Pope Benedict XVI - has suffered damage resulting from an attempted arson; Thomas Peters has a picture. Another church in Spain has also been desecrated. 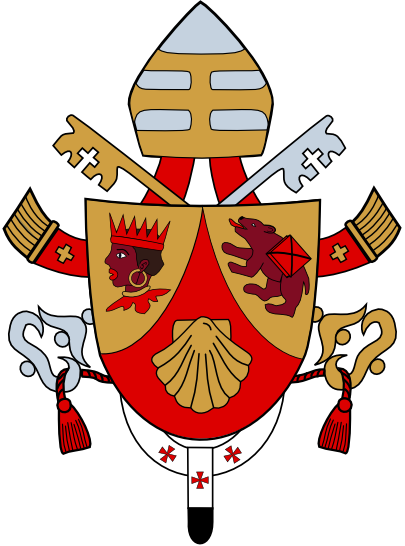 Today is the anniversary of a very happy day, the election of His Eminence Joseph Cardinal Ratzinger to the See of Peter, now gloriously reigning as Pope Benedict XVI. Congratulations, Holy Father! Ad multos annos! 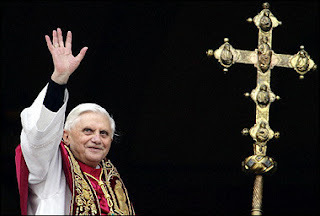 At his general audience last Wednesday Pope Benedict XVI effectively said that holiness is as easy as 1-2-3. In the general audiences of the last two years, we have been accompanied by the figures of many men and women saints: We have gotten to know them up close and to understand that the whole history of the Church is marked by these men and women, who with their faith, their charity, and their lives were the beacons of many generations, as they are also for us. The saints manifest in many ways the powerful and transforming presence of the Risen One; they let Christ possess their lives completely, being able to affirm as St. Paul, "yet I live, no longer I, but Christ lives in me" (Galatians 2:20). Following their example, taking recourse to their intercession, entering into communion with them, "joins us to Christ, from Whom as from its Fountain and Head issues every grace and the very life of the people of God" (Lumen Gentium 50). At the end of this series of catecheses, I would like to offer an idea of what holiness is. How can we make our way of thinking and our actions become thinking and acting with Christ and of Christ? What is the soul of holiness? Again Vatican II specifies: It tells us that holiness is none other than charity fully lived. "We have come to know and to believe in the love God has for us. God is love, and whoever remains in love remains in God and God in him" (1 John 4:16). Now God has amply diffused his love in our hearts through the Holy Spirit, who has been given to us (cf. Romans 5:5); because of this, the first and most necessary gift is charity, with which we love God above all things and our neighbor out of love for him. For charity to grow as a good seed in the soul and fructify us, every faithful one must listen willingly to the Word of God, and with the help of his grace, realize the works of his will, participate frequently in the sacraments, above all in the Eucharist and in the holy liturgy, constantly approach prayer, abnegation of oneself, in the active service to brothers and the exercise of all virtue. Charity, in fact, is the bond of perfection and fulfillment of the law (cf. Colossians 3:14; Romans 13:10); it directs all the means of sanctification, gives them their form and leads them to their end. Perhaps also this language of Vatican II is a bit solemn for us; perhaps we should say things in a still simpler way. What is the most essential? [Step One:] Essential is that no Sunday be left without an encounter with the Risen Christ in the Eucharist -- this is not a burden but light for the whole week. [Step Two:] Never to begin or end a day without at least a brief contact with God. And, [Step Three:] in the journey of our life, to follow "road signs" that God has communicated to us in the Decalogue [the Ten Commandments] read with Christ, which is simply the definition of charity in specific situations. I think this is the true simplicity and grandeur of the life of holiness: the encounter with the Risen One on Sunday; contact with God at the beginning and end of the day; in decisions, to follow the "road signs" that God has communicated to us, which are simply forms of charity. From whence charity for God and for our neighbor is made the distinctive sign of the true disciple of Christ. (Lumen Gentium , 42). This is true simplicity, grandeur and profundity of the Christian life, of being saints. This is why St. Augustine, commenting on the fourth chapter of the First Letter of St. John can affirm an astonishing thing: "Dilige et fac quod vis" (Love and do what you will). And he continued: "If you are silent, be silent out of love; if you speak, speak out of love; if you correct, correct out of love; if you forgive, forgive out of love, may the root of love be in you, because from this root nothing can come that is not good" (7, 8: PL 35). He who lets himself be led by love, who lives charity fully is led by God, because God is love. This is what this great saying means: "Dilige et fac quod vis" (Love and do as you will). Dear friends, how great and beautiful and also simple, is the Christian vocation seen from this light! We are all called to holiness: It is the very measure of the Christian life. Once again St. Paul expresses it with great intensity when he writes: "But grace was given to each of us according to the measure of Christ's gift. ... And he gave some as apostles, others as prophets, others as evangelists, others as pastors and teachers, to equip the holy ones for the work of ministry, for building up the body of Christ, until we all attain to the unity of faith and knowledge of the Son of God, to mature manhood, to the extent of the full stature of Christ" (Ephesians 4:7,11-13). I would like to invite you to open yourselves to the action of the Holy Spirit, who transforms our life, to be, we also, pieces of the great mosaic of holiness that God is creating in history, so that the Face of Christ will shine in the fullness of its brilliance. Let us not be afraid to look on high, to the height of God; let us not be afraid that God will ask too much of us, but let us be guided in all our daily actions by his Word, even if we feel that we are poor, inadequate, sinners: He will be the one to transform us according to his love. Thank you. The Holy See will soon be sponsoring what one might call a "Vatican blognic." In reality, it is a conference for Catholic bloggers sponsoring by the Pontifical Councils for Culture and for Social Communication to be held May 2nd, the day after the beatification of the Servant of God Pope John Paul II. 150 bloggers have been invited by the Pontifical Councils to attend the conference and my friend The Crescat - formerly known also as the Carolina Cannonball - is one of the chosen ones. I admit: I'm a bit jealous. Her blog has brought to me many bursts of uncontrollable laughter, deep thoughts and images to ponder. Her blog is forthright and honest and through it she takes us along on her journey as a single mother in the spiritual life. If you don't yet read her blog regularly, I highly recommend you do so. Now, The Crescat naturally wants to attend the conference but to do so she needs our help. A flight to Rome is not easy to muster up on such short notice and so she has humbly asked the kind assistance of people of good will. Won't you please consider making a donation to help with the expenses of her flight? I've made a donation and I ask you to do the same, however small; many small donations make one large gift. You can click the donate button at the top right of her blog to make a secure donation. Think of it as part of your Lenten alms. And be sure to join me in remembering her and the other bloggers in prayer. But what are we really doing when we join this procession as part of the throng which went up with Jesus to Jerusalem and hailed him as King of Israel? Is this anything more than a ritual, a quaint custom? Does it have anything to do with the reality of our life and our world? To answer this, we must first be clear about what Jesus himself wished to do and actually did. After Peter’s confession of faith in Caesarea Philippi, in the northernmost part of the Holy Land, Jesus set out as a pilgrim towards Jerusalem for the feast of Passover. He was journeying towards the Temple in the Holy City, towards that place which for Israel ensured in a particular way God’s closeness to his people. He was making his way towards the common feast of Passover, the memorial of Israel’s liberation from Egypt and the sign of its hope of definitive liberation. He knew that what awaited him was a new Passover and that he himself would take the place of the sacrificial lambs by offering himself on the cross. He knew that in the mysterious gifts of bread and wine he would give himself for ever to his own, and that he would open to them the door to a new path of liberation, to fellowship with the living God. He was making his way to the heights of the Cross, to the moment of self-giving love. The ultimate goal of his pilgrimage was the heights of God himself; to those heights he wanted to lift every human being. Our procession today is meant, then, to be an image of something deeper, to reflect the fact that, together with Jesus, we are setting out on pilgrimage along the high road that leads to the living God. This is the ascent that matters. This is the journey which Jesus invites us to make. But how can we keep pace with this ascent? Isn’t it beyond our ability? Certainly, it is beyond our own possibilities. From the beginning men and women have been filled – and this is as true today as ever – with a desire to “be like God”, to attain the heights of God by their own powers. All the inventions of the human spirit are ultimately an effort to gain wings so as to rise to the heights of Being and to become independent, completely free, as God is free. Mankind has managed to accomplish so many things: we can fly! We can see, hear and speak to one another from the farthest ends of the earth. And yet the force of gravity which draws us down is powerful. With the increase of our abilities there has been an increase not only of good. Our possibilities for evil have increased and appear like menacing storms above history. Our limitations have also remained: we need but think of the disasters which have caused so much suffering for humanity in recent months. Following the Liturgy of the Word, at the beginning of the Eucharistic Prayer where the Lord comes into our midst, the Church invites us to lift up our hearts: “Sursum corda!” In the language of the Bible and the thinking of the Fathers, the heart is the centre of man, where understanding, will and feeling, body and soul, all come together. The centre where spirit becomes body and body becomes spirit, where will, feeling and understanding become one in the knowledge and love of God. This is the “heart” which must be lifted up. But to repeat: of ourselves, we are too weak to lift up our hearts to the heights of God. We cannot do it. The very pride of thinking that we are able to do it on our own drags us down and estranges us from God. God himself must draw us up, and this is what Christ began to do on the cross. He descended to the depths of our human existence in order to draw us up to himself, to the living God. He humbled himself, as today’s second reading says. Only in this way could our pride be vanquished: God’s humility is the extreme form of his love, and this humble love draws us upwards. Psalm 24, which the Church proposes as the “song of ascent” to accompany our procession in today’s liturgy, indicates some concrete elements which are part of our ascent and without which we cannot be lifted upwards: clean hands, a pure heart, the rejection of falsehood, the quest for God’s face. The great achievements of technology are liberating and contribute to the progress of mankind only if they are joined to these attitudes – if our hands become clean and our hearts pure, if we seek truth, if we seek God and let ourselves be touched and challenged by his love. All these means of “ascent” are effective only if we humbly acknowledge that we need to be lifted up; if we abandon the pride of wanting to become God. We need God: he draws us upwards; letting ourselves be upheld by his hands – by faith, in other words – sets us aright and gives us the inner strength that raises us on high. We need the humility of a faith which seeks the face of God and trusts in the truth of his love. The question of how man can attain the heights, becoming completely himself and completely like God, has always engaged mankind. It was passionately disputed by the Platonic philosophers of the third and fourth centuries. For them, the central issue was finding the means of purification which could free man from the heavy load weighing him down and thus enable him to ascend to the heights of his true being, to the heights of divinity. Saint Augustine, in his search for the right path, long sought guidance from those philosophies. But in the end he had to acknowledge that their answers were insufficient, their methods would not truly lead him to God. To those philosophers he said: recognize that human power and all these purifications are not enough to bring man in truth to the heights of the divine, to his own heights. And he added that he should have despaired of himself and human existence had he not found the One who accomplishes what we of ourselves cannot accomplish; the One who raises us up to the heights of God in spite of our wretchedness: Jesus Christ who from God came down to us and, in his crucified love, takes us by the hand and lifts us on high. Today we celebrate the Lord Jesus' triumphal entry into the great city of Jerusalem when he was welcomed with much joy and gladness by the crowds and acclaimed king. It was right for the crowds to welcome him as king for the actions Jesus undertook as he entered the city were those of a king. In days gone by it was the king's privilege to requisition animals for his use, particularly those animals upon which no one had yet sat. For this reason he said to his disciples, "Go into the village opposite you, and immediately as you enter it you will find a colt tied, on which no one has ever sat; untie it and bring it" for "the Lord has need of it" (Mark 11:2, 3). He enters the city in this way to fulfill the prophecy of Zechariah: Rejoice greatly, O daughter of Zion! Shout aloud, O daughters of Jerusalem! Behold, your king comes to you; triumphant and victorious is he, humble and riding on a donkey, on a colt the foal of a donkey" (Zechariah 9:9). Of the Messiah it was foretold, "The scepter shall not depart from Judah, nor the ruler's staff from between his feet, until he comes to whom it belongs; and to him shall be the obedience of the peoples. Binding his foal to the vine and his doney's colt to the choice vine" (Genesis 49:10-11). When the people cried out to him, "Blessed is he who comes in the name of the Lord" they welcomed him as the one to whom obedience is owed; their recognized their king (Matthew 21:9). Saint Luke includes an important detail of the Lord's entrance, namely, that the crowds "set him upon" the colt (Luke 19:35). It is a phrase that hearkens to the enthronement of King Solomon, the son of David. To the priest Zadok King David gave the following command: "Take with you the servants of your lord, and cause Solomon my son to ride on my own mule, and bring him down to Gihon; and let Zadok the priest and Nathan the prophet there anoint him king over Israel" (I Kings 1:33-34). After Jesus was seated on the colt, "most of the crowd spread their garments on the ground," a clear sign of their recognition of the kingship of Jesus (Matthew 21:8). It is an act foreshadowed in the history of Israel: "Then in haste every man of them took his garment, and put it under him on the bare steps, and they blew the trumpet, and proclaimed, 'Jehu is king'" (II Kings 9:13). After Jesus entered the city and having gone to the temple, he "looked round at everything," again to fulfill the prophecy: "Then I will encamp at my house as a guard, so that none shall march back and forth; no oppressor shall again overrun them, for now I see with my own eyes" (Mark 11:11; Zechariah 9:9). He enters the city of Jerusalem, to win his great battle, for "on that day the Lord their God will save them for they are the flock of his people" (Zechariah 9:9). Surrounded with all of these clear and obvious signs, the crowds rightly recognized Jesus as their king, but they misunderstood his kingship and for this reason they would soon reject him. When the Jesus comes to us, what will our response be? He comes to us each day; he has not abandoned his people. In every celebration of the Eucharist he comes to us. The Church greets the Lord in the Holy Eucharist as the one who is coming now, the one who has entered into her midst. At the same time, she greets him as the one who continues to come, the one who leads us toward his coming. As pilgrims, we go up to him; as a pilgrim and takes us up with him in his 'ascent' to th Cross and Resurrection, to the definitive Jerusalem that is already growing in the midst of this world in the communion that unites us with his body (11). Let us, too, welcome Jesus as King and give our obedience to him who gave his life for us. Is the short form helpful?